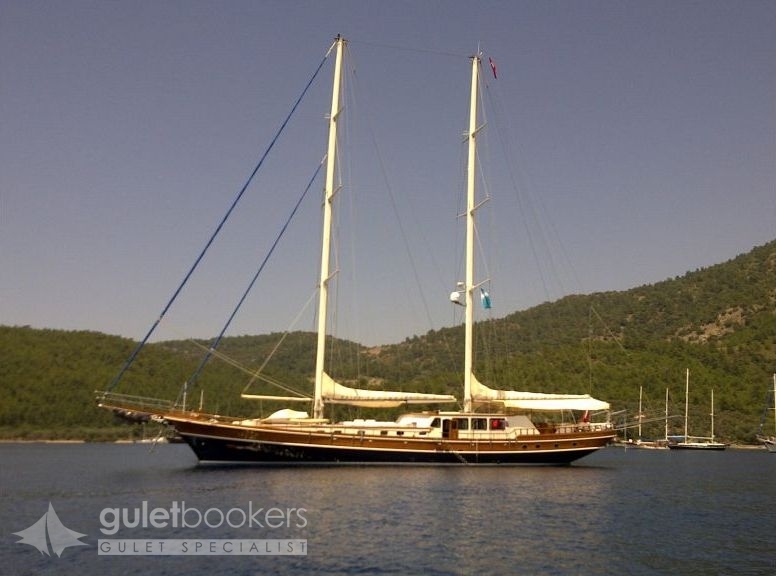 The Deluxe gulet Kaya Guneri 4 is a superb traditional Bodrum gulet complete with sloping stern, high bow and long bow sprit. 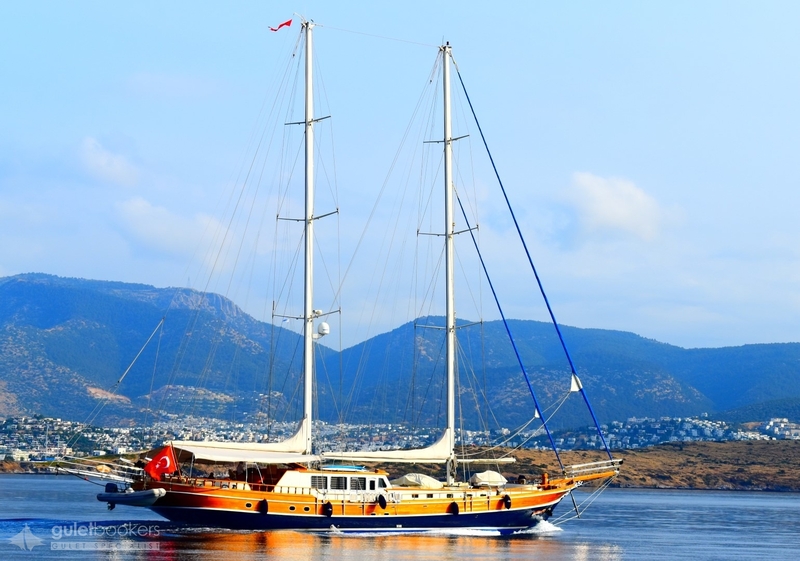 The sight of her sailing down the Aegean coast of Turkey under full sail will warm any traditionalist’s heart, but there is nothing better than actually being one of the guests relaxing beneath those sails as she moves across the water. 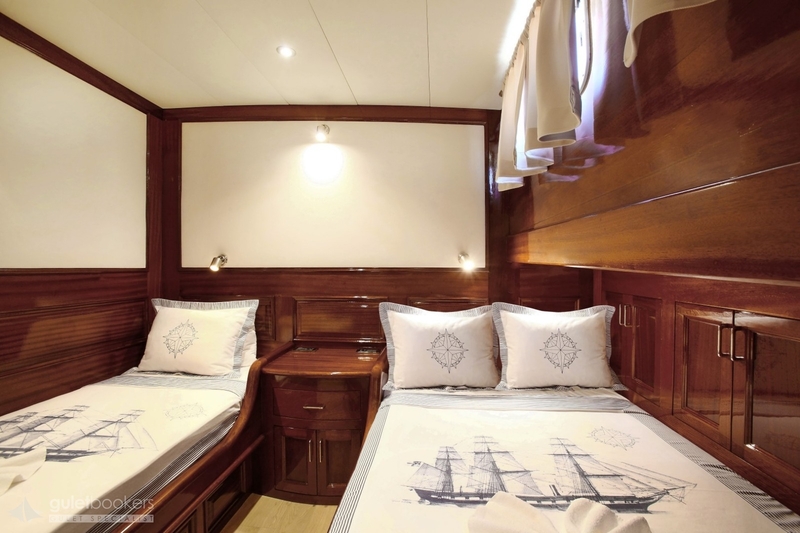 Up to twelve guests can enjoy all the generous deck space of her 35 meters length, and the refined, uncluttered elegance of the six roomy cabins for their accommodation. 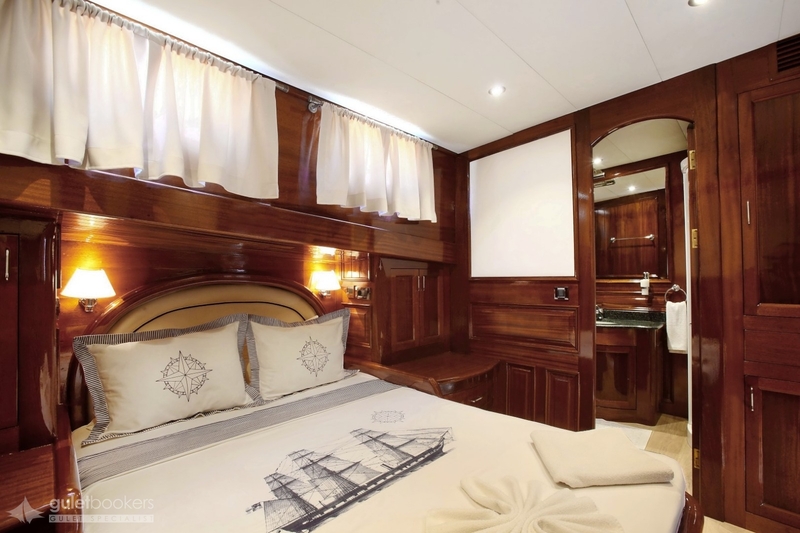 The interior and cabins are nautical in style, displaying the craftsmanship of the master carpenters in the abundance of polished mahogany panelling and decoration throughout, balanced with the white ceiling and nautical print textiles. 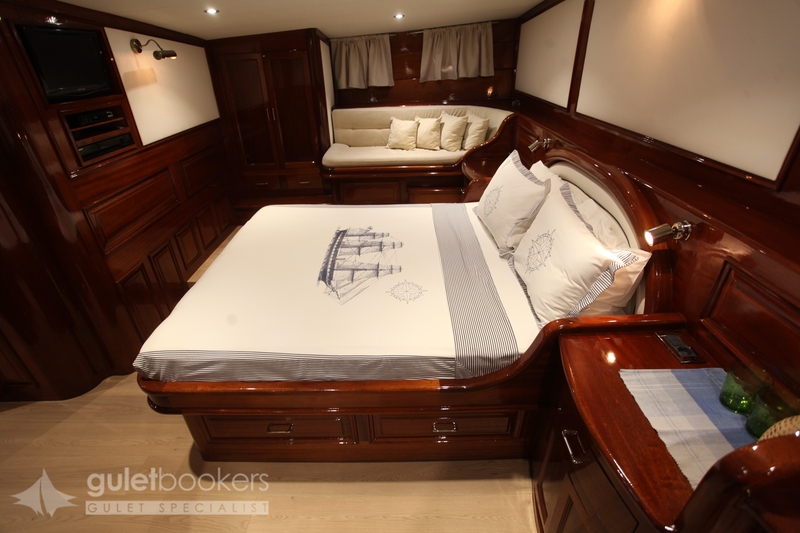 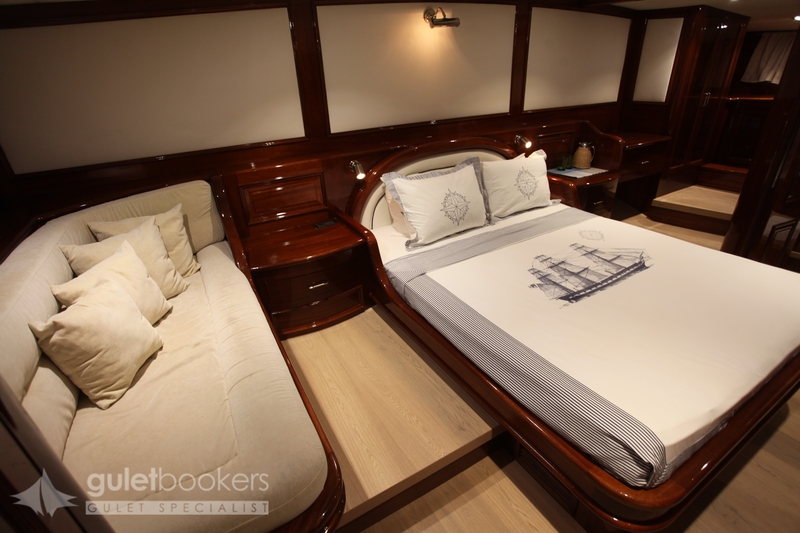 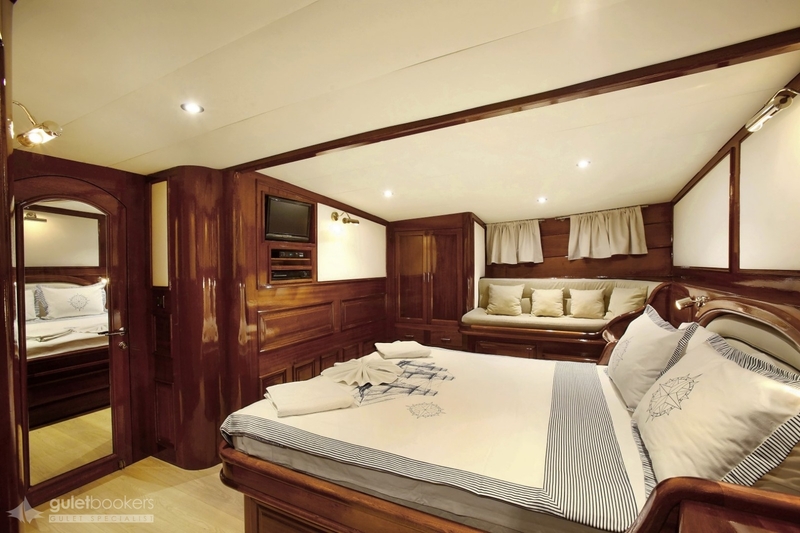 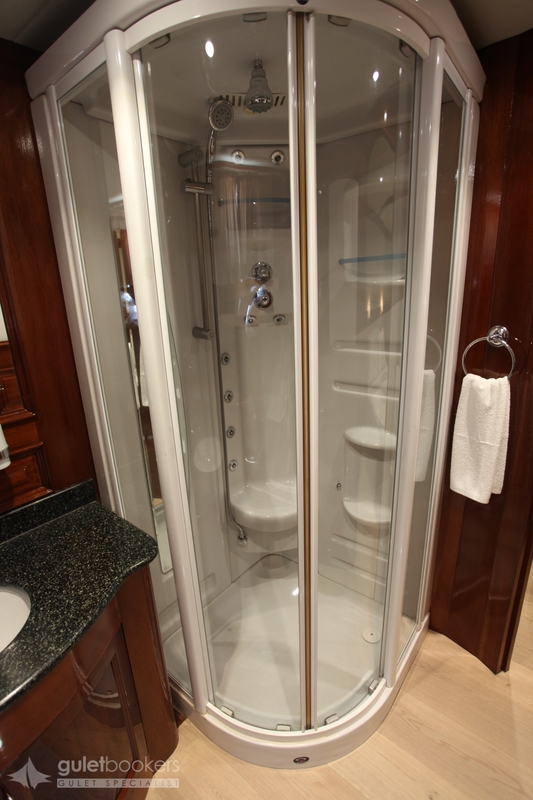 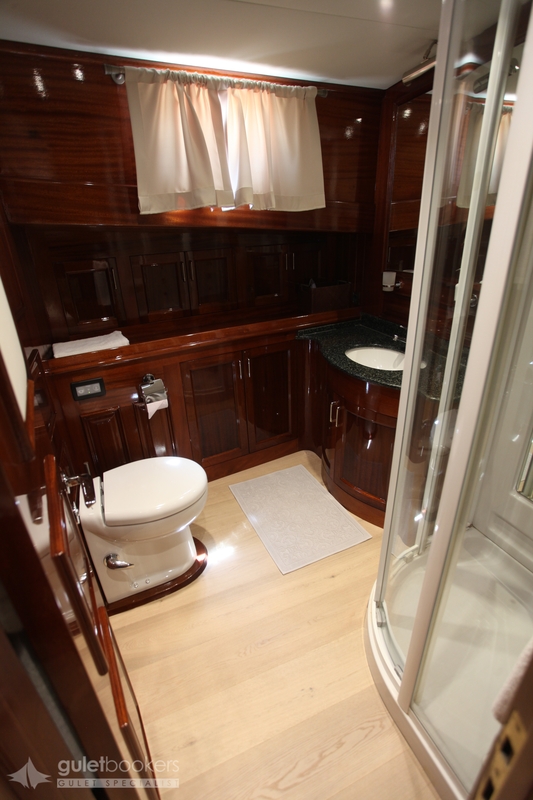 Two master cabins at either end of the boat, fore and aft, enjoy close to the width of the beam for space, and side seats, vanity desk and storage. 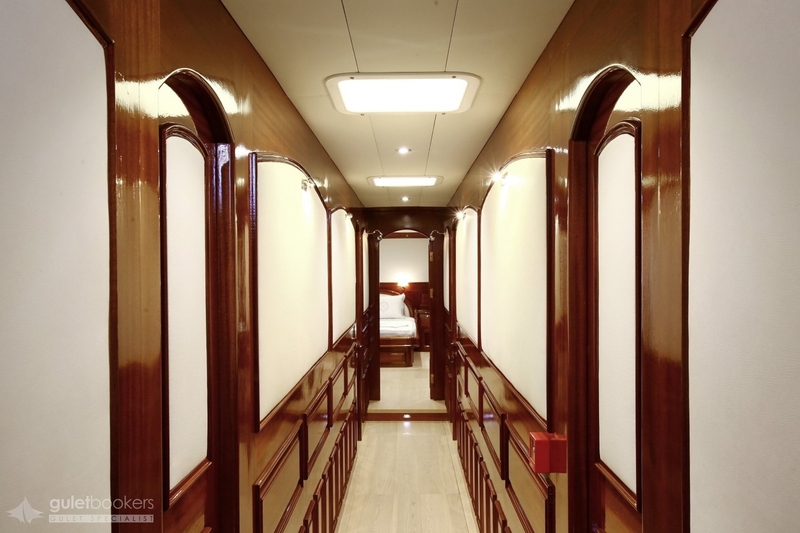 The forward master and four other cabins are grouped together, while the aft master cabin has its own access from the saloon. 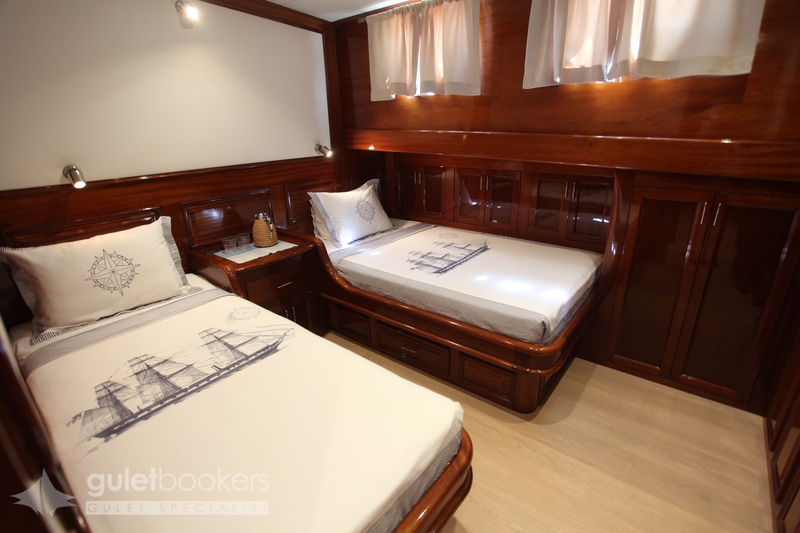 All four double bed cabins have walk-around beds, while the twin bed cabin beds are full size and the cabin is also roomy with storage space. 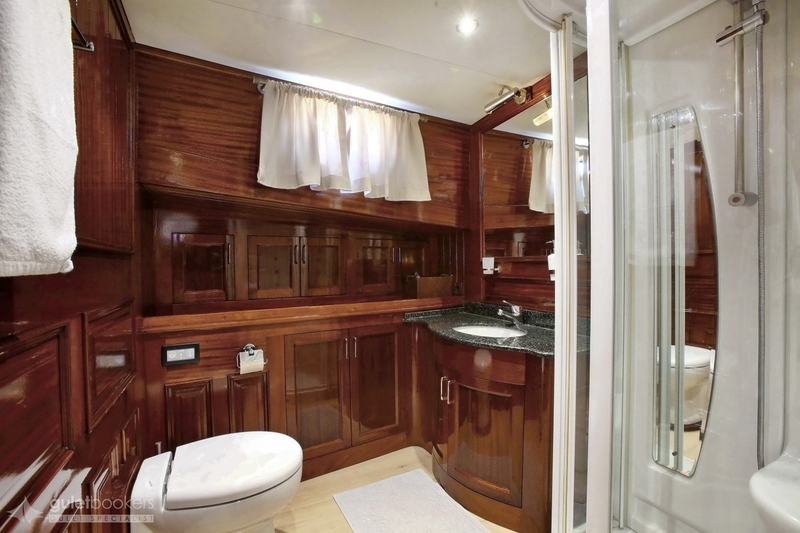 All cabins enjoy LCD TV, DVD, CD, MP3 players at their disposal, have private well-appointed bathrooms and air-conditioning is available throughout. 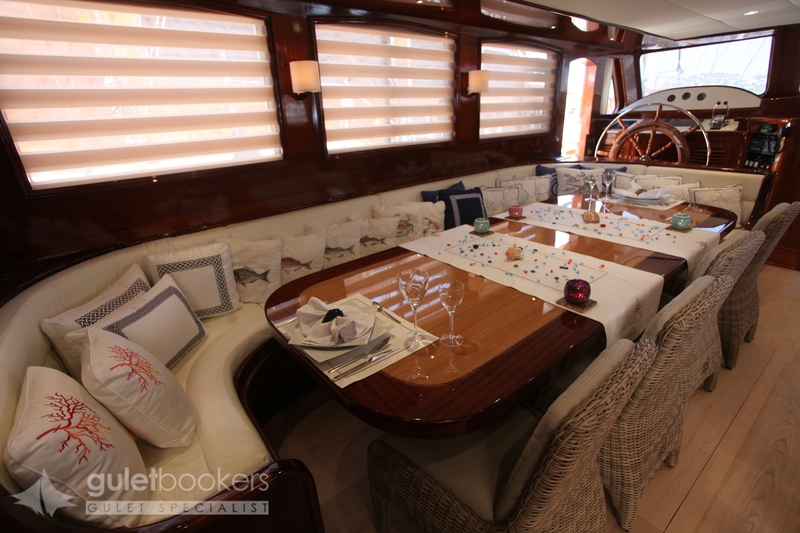 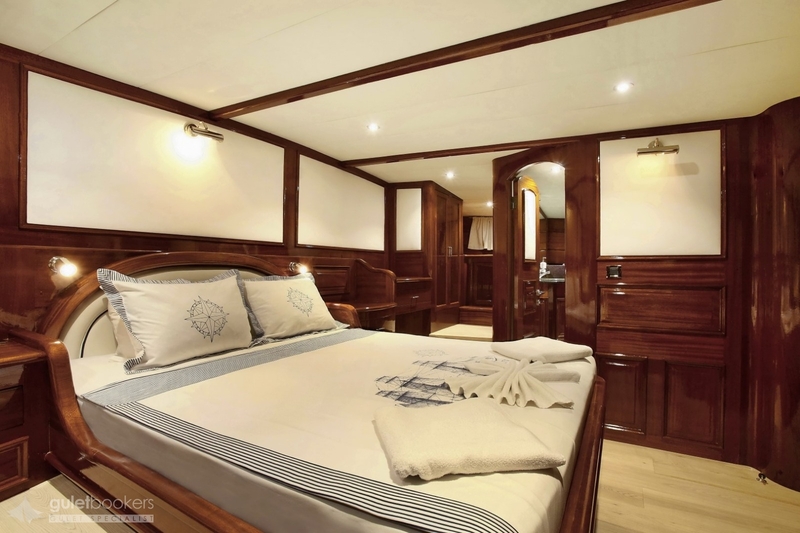 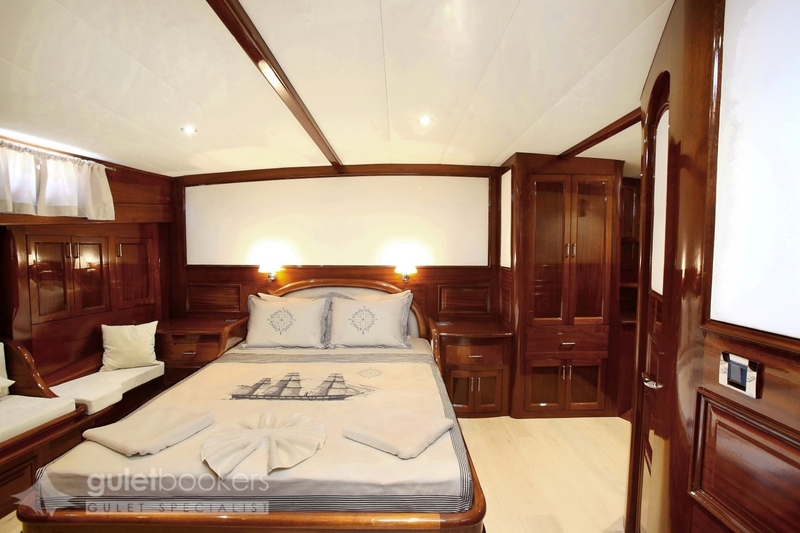 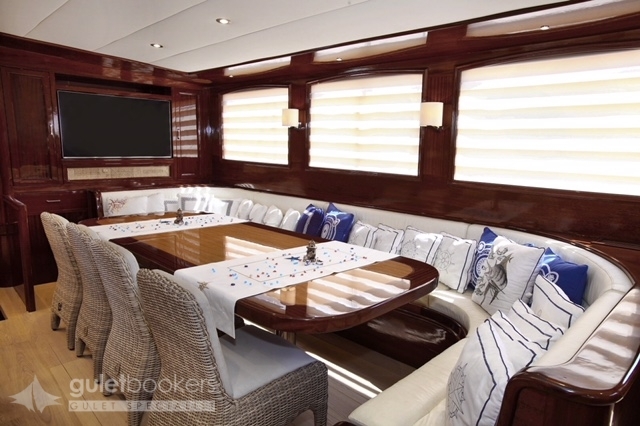 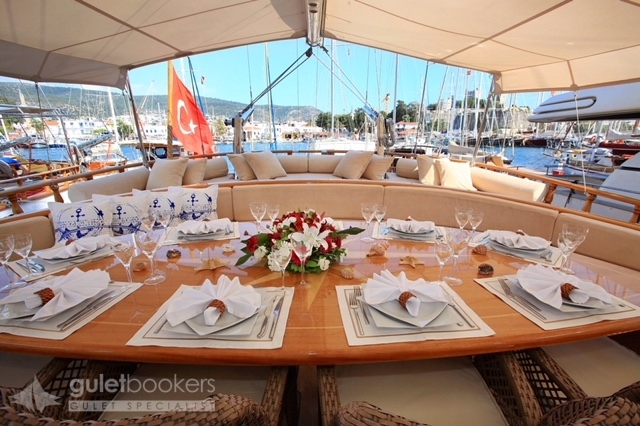 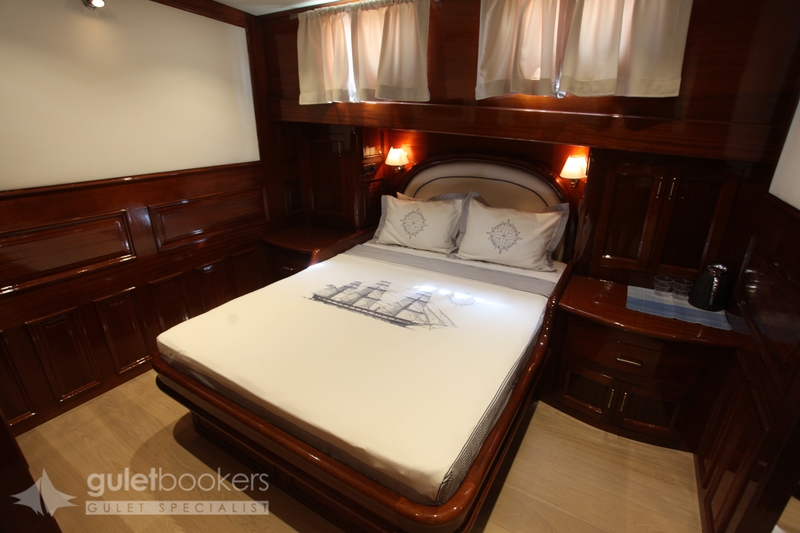 The spacious saloon on luxury gullet Kaya Guneri IV is a calm retreat for either dining at the full length table, or relaxing on the long banquette or corner settee, or for enjoying the large television, music and entertainment equipment. 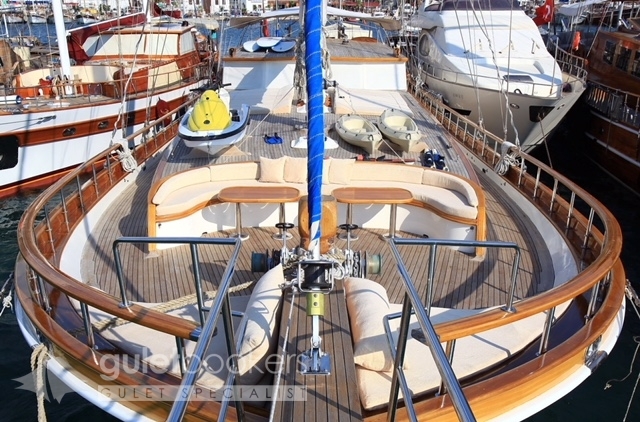 The carefree pleasures of relaxing on the deck invites everyone to spend as much time as possible in the fresh air. 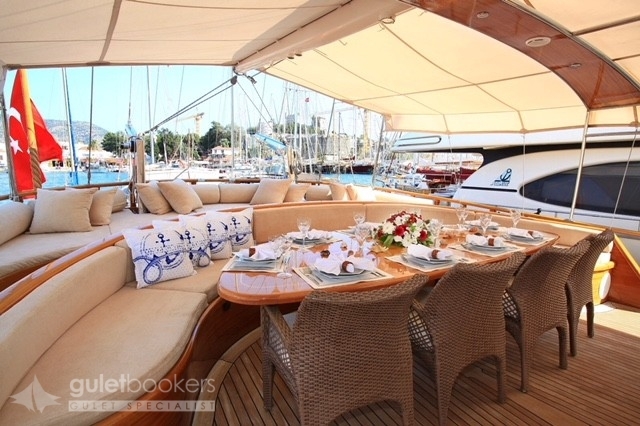 Enjoy leisurely and excellent meals at the dining table under the awning, or further back on the lusciously wide cushion pads across the stern. 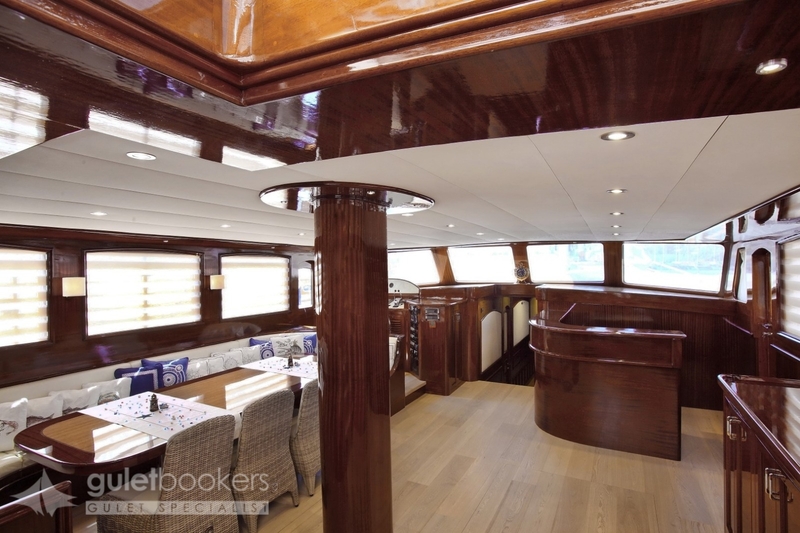 Up front on the fore-deck there is more than enough space for personal sunbeds and then the bow seat and cushions are the perfect spots to chat or gather for the sunset cocktails. 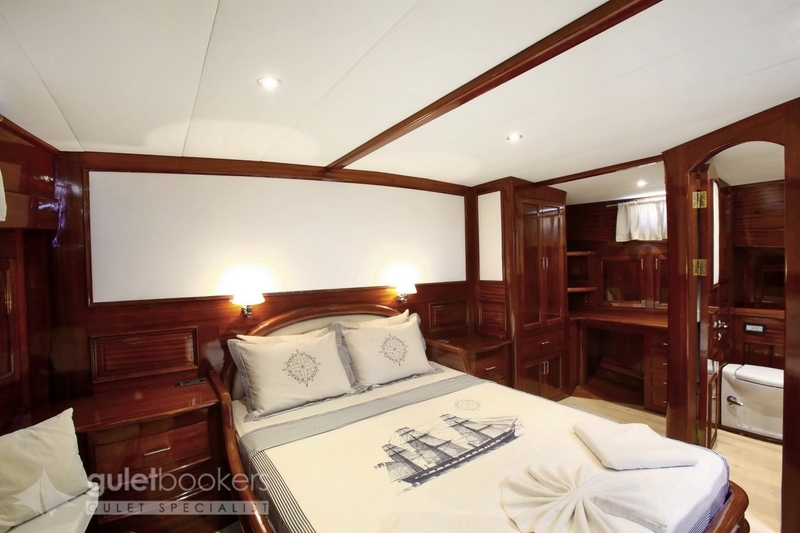 There is also space to carry the canoes and water toys for the active guests to enjoy on the water in the quiet bays and coves the captain knows so well. 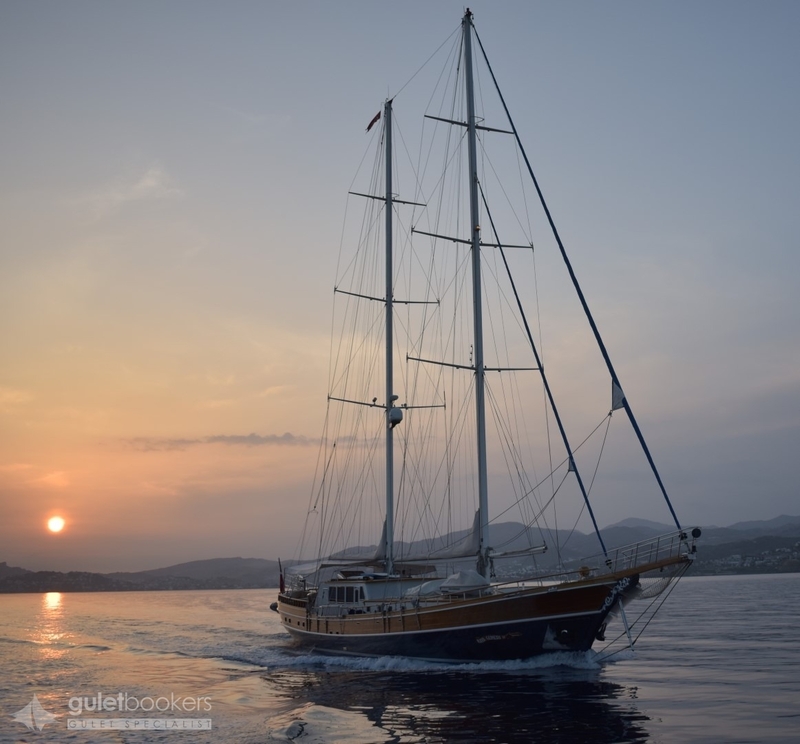 The friendly and very skilled crew on yacht Kaya Guneri IV makes the guests holiday cruise complete with attentive service anticipating your needs, superb meals and immaculate maintenance. 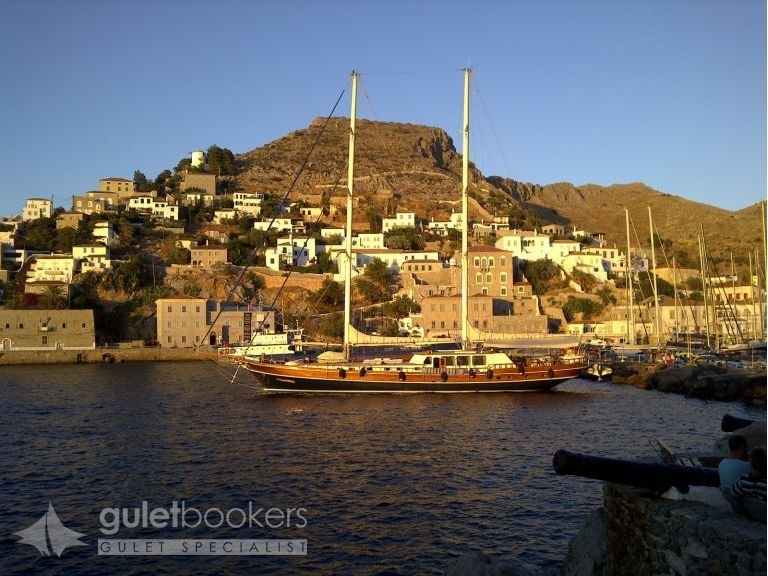 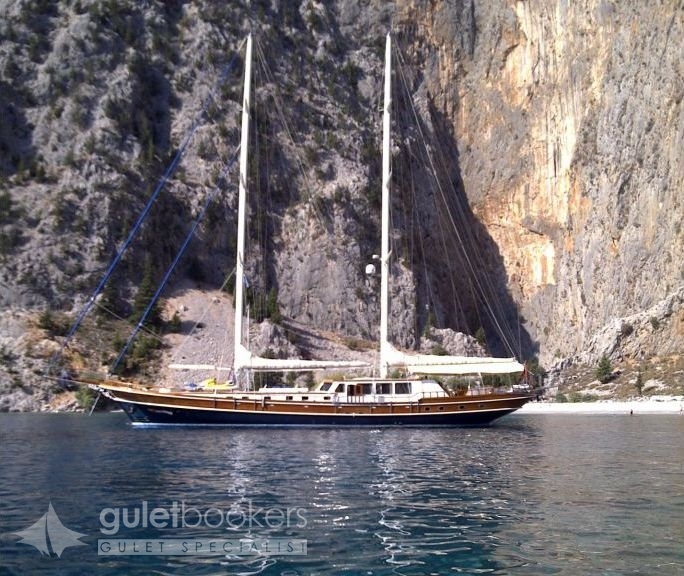 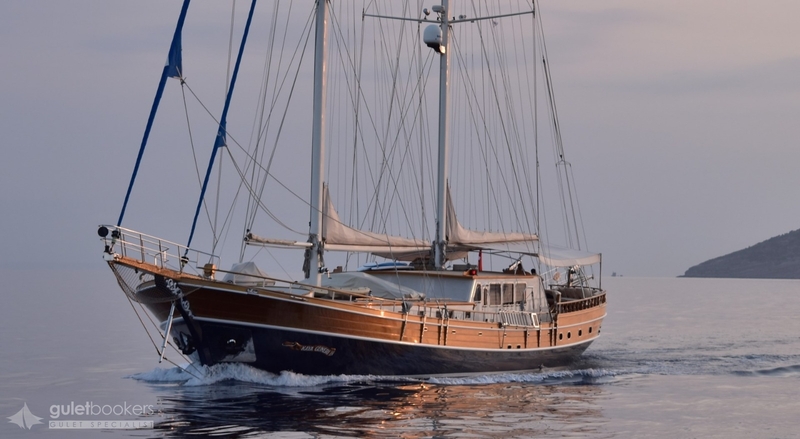 The classic gulet Kaya Guneri 4 will carry guests on a carefree, thoroughly relaxing blue cruise holiday along the stunning coasts of Turkey and among the Greek Islands.